“I think I controlled the first two games well,” said Hania, “but the third was really close and I had to work hard to stay ahead, I really didn’t want it to go to a fourth. It was a similar story today and Willstrop, feeling the effect of some brutal rallies at the end of the second, went 0-6 down in the third. As the end approached Willstrop asked for a let … “it’s got to be, I’m two-nil down and getting hammered,” he pleaded, and the ref (from Yorkshire) agreed. It was only a stay of execution though a Coll wrapped up the title soon enough. “It’s been a really good weekend,” said the new champion, “the atmosphere has been great from the start and I’ve loved playing on this court with a big crowd, even if not many of them were supporting me! Willstrop took over an hour to deny Clyne, the 2016 and 2017 champion, and a brutal first game accounted for half of that time. 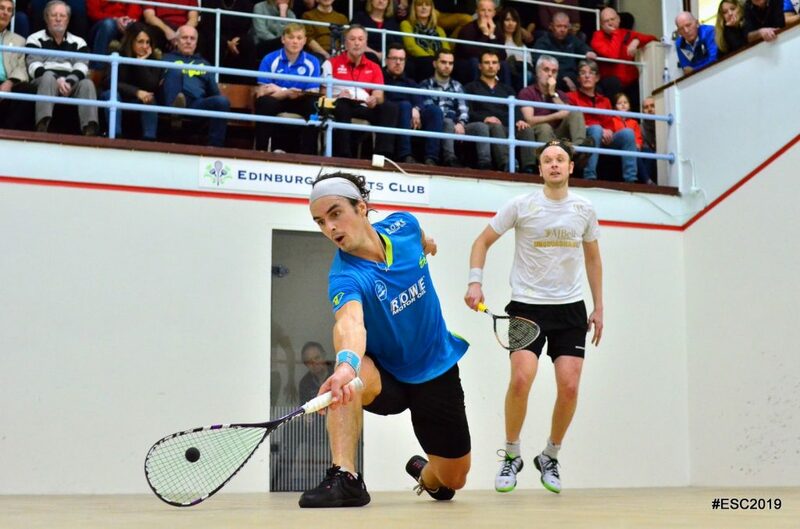 Having taken it 16-14 Willstrop ‘hit a bit of a wall’ in the second as Clyne levelled 11-2. 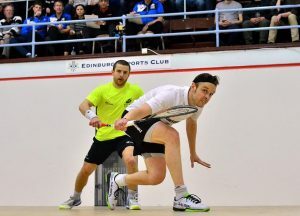 The third was again close, and when Willstrop took it 11-9 it felt decisive and so it proved as the Englishman established a winning lead before closing out the fourth to end a run of three Scottish champions. 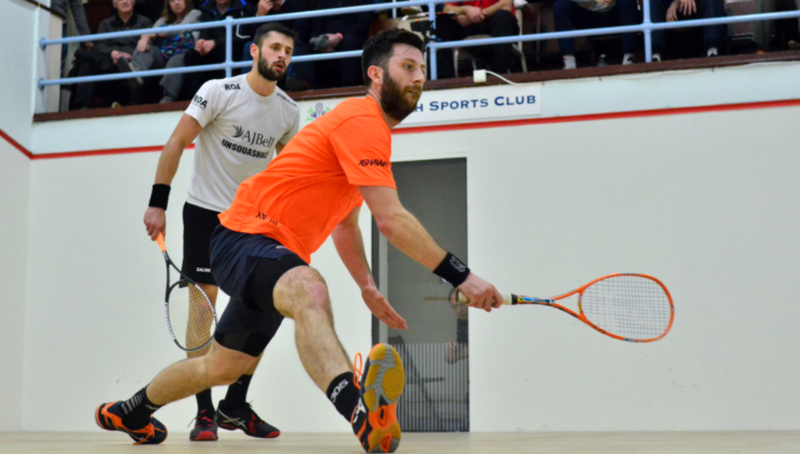 Selby has won the event five times and is well accustomed to ESC’s court five, but tonight Kiwi Coll, the new world #6, took an early lead in the opening game and held Selby’s courtcraft in check as he won in straight game, accelerating through the third. “It’s great fun playing here, the crowd really gets involved even if they’re not on my side,” said Paul. “Rachael appeared out of nowhere for the world juniors in Chennai 09 and you could see she was a bit different, and very effective,” said Olivia. 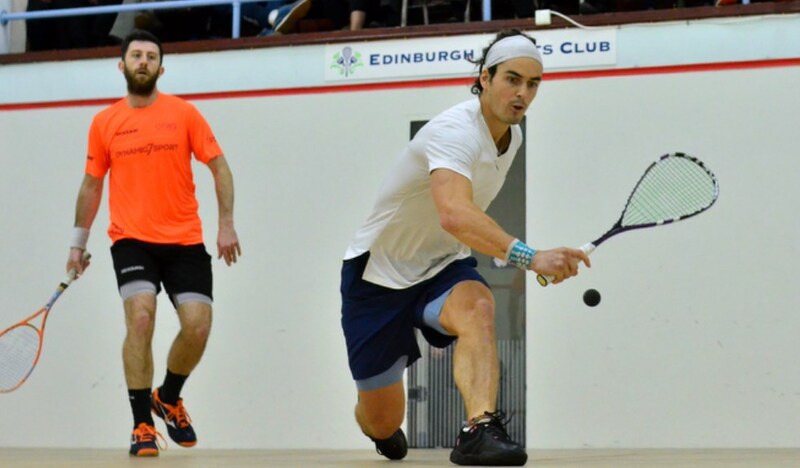 “She’s had some good results so I knew I had to be onto it from the start, I’m just pleased to win and especially pleased to make my first final since Colombia two years ago. 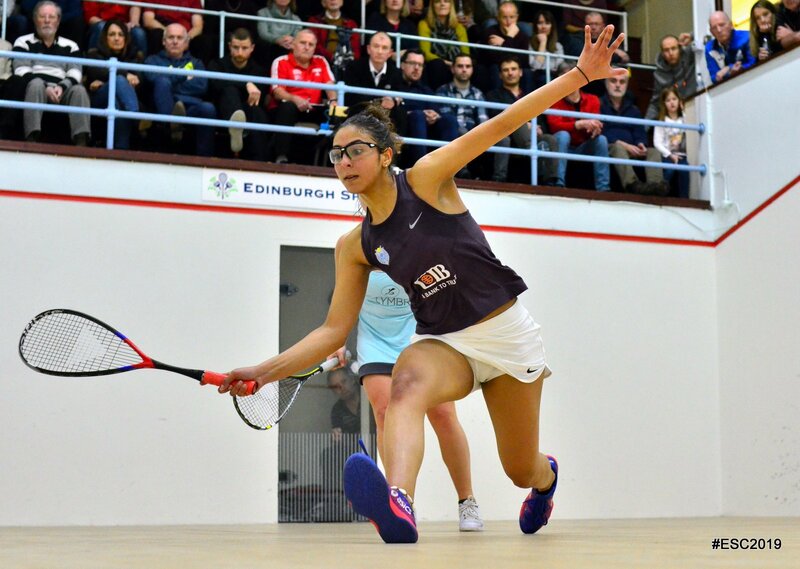 Second seeded Hammamy, the newly re-crowned British Junior Open U19 Champion, was in devastating form against Alexandra Fuller, the South African falling behind early in each of the three games and never able to catch up as Hania piled on the pressure and kept the flow of winners rolling. 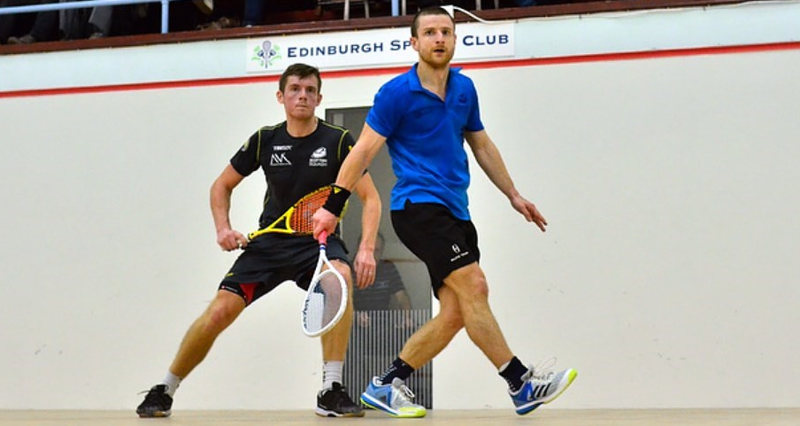 The opening men’s quarter-final was a much anticipated all-Scottish clash between Greg Lobban and Alan Clyne, who between them have won the last three titles with Lobban coming in as the defending champion. “Greg’s been playing well and getting some great results,” said Clyne, “so it’s really pleasing to be able to get a win over him. Hopefully I can go on to regain the title and keep it in Scottish hands. Englishman James Willstrop and five-time champion Daryl Selby beat compatriots Patrick Rooney and George Parker in straight games, with second seed Willstrop set to meet Clyn for a place in the final while Selby meets new World #6 Paul Coll after the top-seeded Kiwi ended the run of unseeded home favourite Rory Stewart 11-7, 11-7, 11-7. 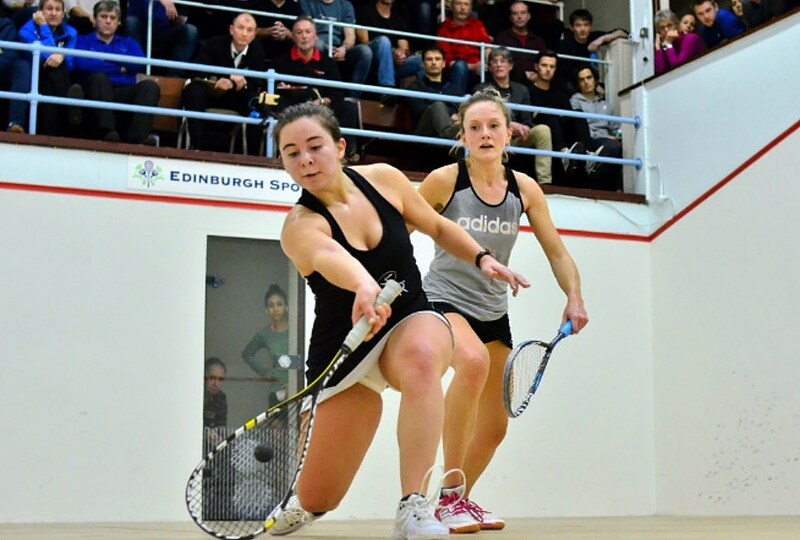 Rachael Chadwick recorded her “best ever win” to oust 2015 champion and third seed Fiona Moverley in a nailbiting five-setter to open the quarter-finals at Edinburgh Sports Club. She’ll meet top seed Olivia Blatchford Clyne who won a close four game tussle against fellow American Olivia Fiechter – their first matchup! In the bottom half of the draw Egyptian second seed Hania El Hammamy beat Satomi Watanabe in straight games while South African fourth seed Alexandra Fuller came through in five games to deny Enora Villard. 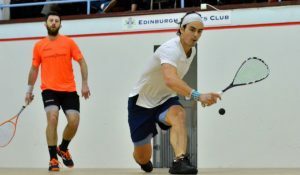 Thursday evening at Edinburgh Sports Club saw yesterday’s women’s winners take on the seeded players as they bid to reach the quarters, plus eight men’s matches to decide who was pitted against the men’s seeds. 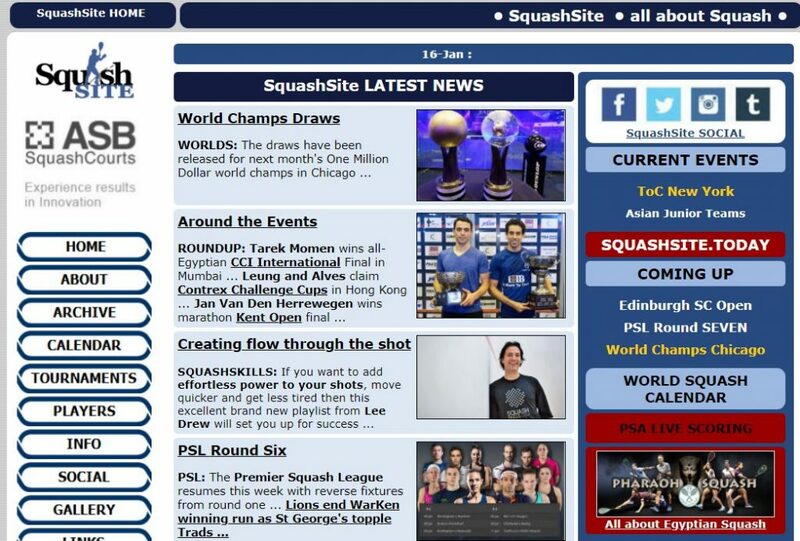 Seven of the women’s matches went to seeding, the exception being Rachael Chadwick’s straight games win over 7th seed Menna Hamed, and she faces a quarter-final against the only other Englishwoman left, 2015 champion and third seed Fiona Moverley, who almost let two big leads slip as she beat Salma Youssef in straight games. South Africa’s Alexandra Fuller also won in three, but the fourth seed had to come from 3-10 down in the first and 7-10 in the third to see off Farah Momen. She meets sixth seeded Frenchwoman Enora Villard, who survived a really tough five-setter against Jasmine Hutton. 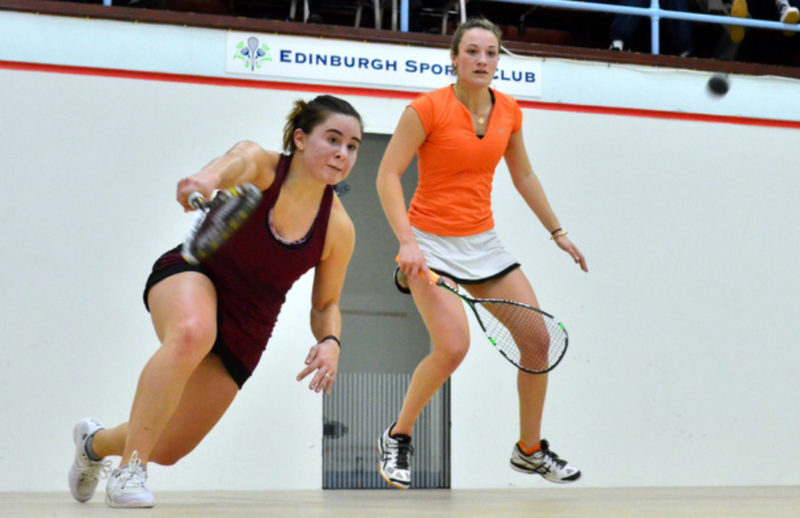 An American semi-finalist is guaranteed after top seed Olivia Blatchford Clyne and Olivia Fiechter both won impressively – Feichter ending the run of local heroine Georgia Adderley in straight games. 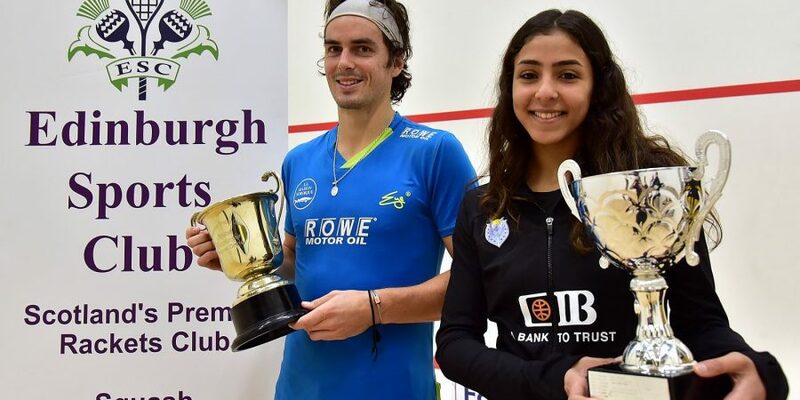 The sole Egyptian success came as second seed Hania El Hammamy accelerated away from Anna Serme after a close first game, setting up a quarter-final against Japan’s fifth seed Satomi Watanabe who ended hopes of home success with a four game win over Ally Thomson. There were five home victories in the men’s matches as Kevin Moran, Dougie Kempsell, Jamie Henderson, Rory Stewart and Fergus Richards all booked matches against the seeds tomorrow, Richards having the hardest run as he overcame former British O35 champion Darren Lewis in a 72-minute five game marathon. 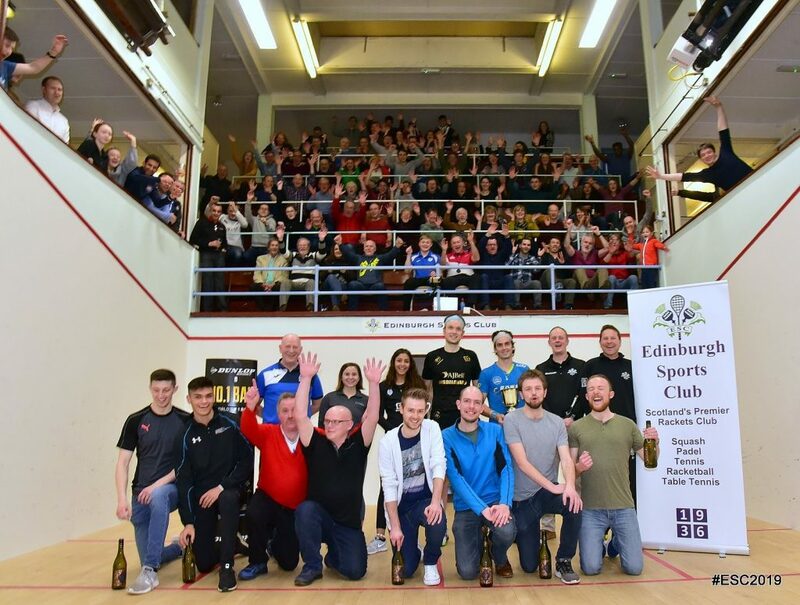 The 2019 edition of the Edinburgh Sports Club Open got under way in the Scottish capital with eight first round matches in the Women’s PSA Challenger 20 event. 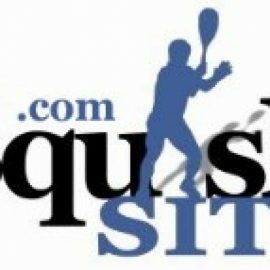 There were two home wins as home club wildcard Georgia Adderley came through a tough five-setter against Clhoe Mesic and Alison Thomson beat Nadia Pfister in straight games. It wasn’t to be a home hat-trick though as Anna Serme beat Elspeth Young in three, to claim her first ever Edinburgh win after many attempts! 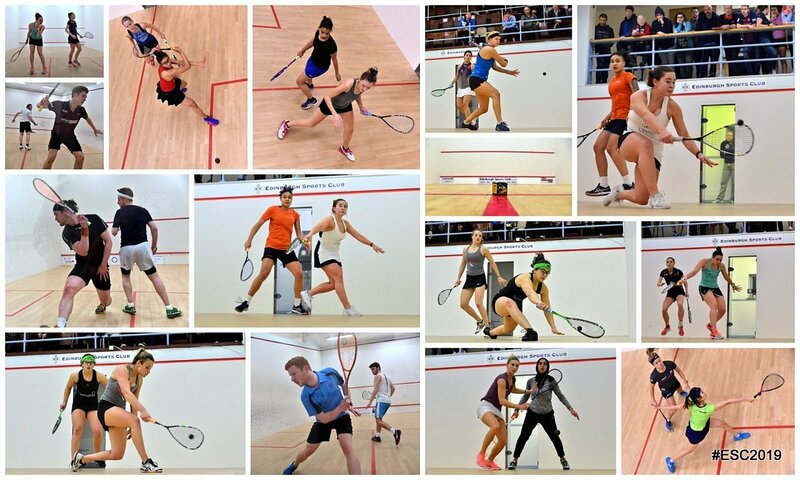 Recently crowned British U23 Open champion Jasmine Hutton came from a game down to upset Milnay Louw, further English success came as Rachael Chadwick got the better of Tessa ter Sluis in five games and Kace Bartley beat Wales’ Ali Loke in three. 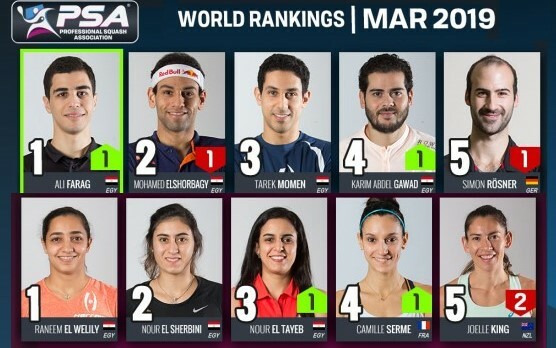 There were two Egyptian winners, Salma Youssef and Farah Momen booking their places in tomorrow’s round two which sees the top eight seeds enter the fray.